Beef ranchero is a delicious one pot meal that can be eaten in all sorts of ways - you can have it as tacos, quesadillas, as a soup, or over rice. I recently went a week and a half without gas in my apartment, so I needed yummy things I could make in an electric pressure cooker. Beef ranchero fit the bill perfectly! Step 2: Prep the Veg and Meat! Add LOTS of salt and pepper to the beef and mix with your hands. A couple big pinches at least. Once browned, transfer to a plate to rest. Add the vegetables and spices to the pot and cook for a couple minutes or until the onions become slightly soft and translucent. Add back in the meat plus the juices that have accumulated. Then add the tomatoes, tequila and beef stock. 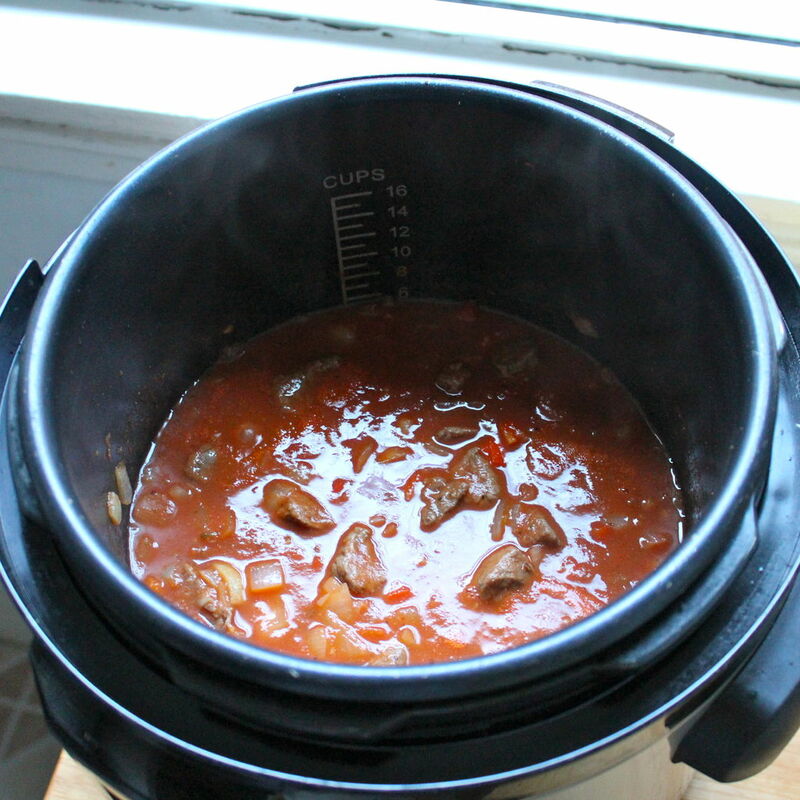 If using a pressure cooker, cook at high pressure for 15 minutes and naturally release the pressure. If doing it on the stovetop, cover and simmer for 45 minutes to an hour or until the meat is nice and soft. Make sure to drain the meat well if doing tacos - it makes lots of sauce! Look's good enough to eat! As A life long bachelor I have been forced to learn how to cook as it's A 5 mile round trip to the gas station for Slim Jims and beef jerky! I like easy , one pot meal's that I can, if necessary, eat out of the pot! I have several pressure cooker's that I have collected through the year's ( one of the hazards of buying junk boxes at auction's) and I have found that stainless steel just won't brown meat. Aluminum is better but I cook in cast iron dutch ovens or chicken fryers if I have A choice and as I don't care about time any longer since I retired ( I like to say I have nothing to do and all day to do it!) cast iron work's for me. I will try your recipe as soon as I can and thanks much! I would recomend this recipe to anyone with that condition. Tequila an excellent addition to many dishes, or on the side. I may give this one a try, Thanks. This looks awesomely good! I can smell it through the PC! Do you deliver? Yum! I'm getting hungry looking at this and I just had a late night snack!